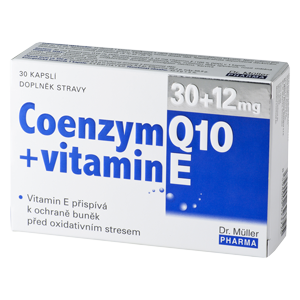 Coenzyme Q10 is an agent resembling vitamins and exists in every cell of the body. It is the only non-protein component of the system of electron (energy) transmission in cells. The speed of energy production in cells depends on the quantity and functioning of coenzyme Q10. It is a very important antioxidant of cell membranes and fatty tissue. Each capsule contains 30 mg of Coenzyme Q10 and 12 mg of vitamin E.
1 capsule daily. Swallow the capsule and follow with sufficient amount of some drink. Do not exceed the recommended doses. The product does not substitute varied diet. The product should not be used in children below 12 years of age. Quinoline yellow can influence adversely the aktivity and attention of children. Keep out of the sight and reach of children.